2018’s Donut county, developed by Ben Esposito and published by Annapurna interactive, with its quirky world, cell shaded, colorful, charming visuals, and inventive puzzles- found itself on a number of Best of Lists in the independent game scene. But for many critics, as well as myself, what brought the whole experience together was Daniel Koestners contribution to the effort in the form of his brilliant soundtrack. Koestner forgoes straightforward chiptune for lo-fi, chill beats, comprised of elegant strings, discordant metallic clangs, moorg-esque melodies, and a choir of bells and whistles. The album is acoustic and electronic – it aligns equally with chill study beats playlists on youtube and experimental techno house; almost Forest Swords meets Animal Crossing. Koestner releases music independently as Vulpixic on bandcamp, where he dubs his work as “experimental folk-hop”, these are the words I was looking for in describing Koestners music, it contains the compositional complexity of experimental electronica while maintaining the warmth and satisfying rhythm of folk and hip hop. Each track in the album starts out simple enough, but Koestner slowly but surely introduces new musical motifs, juxtaposing rhythms, that shift between various styles while remaining grounded in its cartoonish, quirky, warm world. There is much breadth within Koestners sonic toolbox, including found sounds and field recordings, of claps and household percussions, and ambient noises like marbles shifting and clanking in the palm of a hand. Paired with a myriad of string instruments, and moorg inspired electric keyboards, Donut County’s soundtrack becomes something that is simply fun to listen to. The game revolves around a growing hole, controlled by the player, consuming everything and everyone in its path in Donut County in order to solve puzzles. The soundtrack highlights the charming paradox of the games tone- it becomes the perfect comfort as I bring apocalyptic destruction to the Richard Scarry-ian environment– it, like everything that falls in the expanding hole of doom, is disinterested while vibrant, as eccentric as it is existential. One trend within the indie game scene in recent years has been to match vintage visual aesthetics with chiptune compositions, producing soundtracks like FEZ OST, whose composer, Disasterpeace, has gone on to craft the soundtrack for 2014’s hit horror film It Follows. Since then, the soundtracks to these games have had an increased responsibility, a good soundtrack can very well be the piece that pushes the game to the forefront of conversations and cements its legacy in years to come (The soundtrack to 2012’s Faster Than Light by Ben Prunty remains a top best-selling soundtrack on bandcamp, 7 years later). These recent movements within the independent game industry have brought music to the forefront of a games identity, calling for musicians who can combine the sonic heritage of 16-bit tunes with their own musical styles, be that anything from acoustic folk to experimental hip-hop. 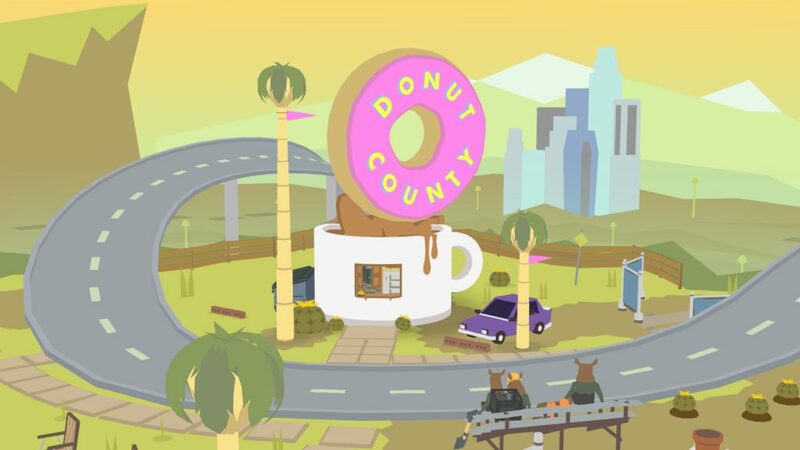 Donut County Original Soundtrack is a wonderful addition to that trend, blending styles masterfully and complementing the game to the point of symbiotic necessity- it has positioned itself to be the soundtrack to beat in 2019.